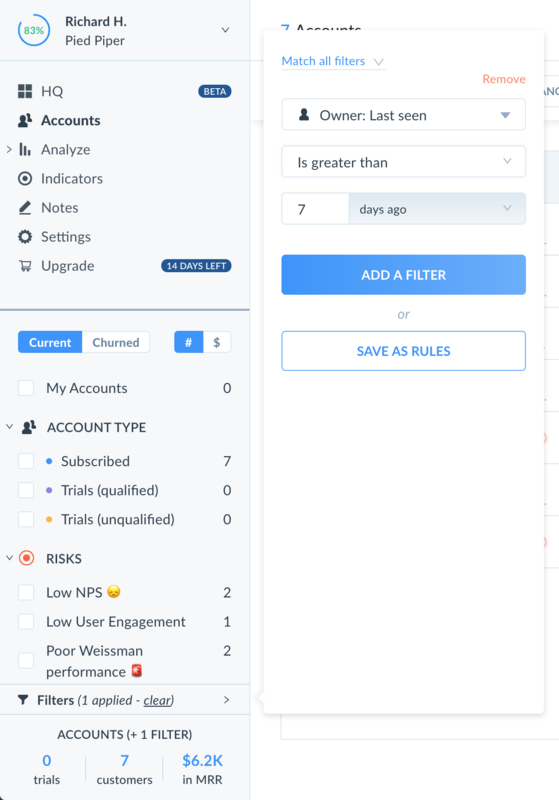 Along with assigning the CSM on your team responsible for a customer, you can also assign a user at the customer that 'owns' the account - i.e. they basically pay the bill for your service. Let's go over how this works and why you'll want to do this! By default, we'll auto-assign the first user at the customer to be the Account Owner. In many cases, that's accurate since the first user is likely to be the one to input the credit card that pays for your service. However, if you'd like to change this, simply do so by clicking on the owner on the customer's dashboard. Owner: Last received message - View and search for customers using the last date the owner sent you a message. Note that this requires you enable conversation tracking in Vitally. Owner: Last sent message - View and search for customers using the last date you sent the owner a message. Note that this requires you enable conversation tracking in Vitally. Using these fields, you can run reports that show customers where the owner hasn't logged in for over a week (as an example). Naturally, you can pair this with Indicators to be automatically notified of customers with owners that start to lose interest in your product! Setup a Zap in Zapier that is triggered when a customer has that Indicator active in Vitally. Create an Action on the Zap using your support tool (e.g. Intercom, Front, etc) to automatically email the Account Owner to try and understand why they've stopped using your product.